About 1.5 years ago when the credit crisis started unfolding few people outside the financial sector noticed consequences but in the last couple of months nearly every industry started to get affected by this worldwide recession. People are consuming less, major manufacturers are cutting back their production and thousands are getting fired. “Many hotels are dropping their nightly rates, some as much as $75 a night,” CEA said on its site. CES usually locks down everything in Las Vegas, from hotel rooms to restaurants and cabs, as more than 100,000 people storm the city to admire the next big thing in technology, whether it be tiny phones or 150-inch TVs. 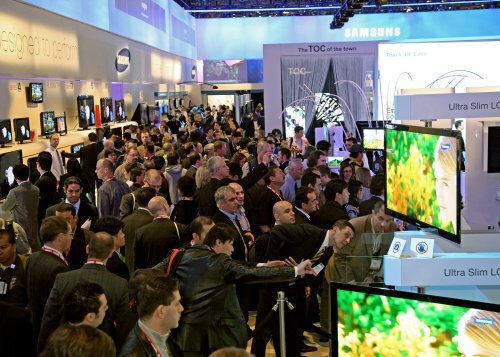 The four-day event is a pivotal showcase for more than 2,000 gadget makers from some 140 countries. In previous years it has been the platform where breakthrough products such as plasma TVs and Microsoft Corp’s Xbox video game console first saw the light of day. Wall Street financial analyst Shannon Cross said she heard prices were dropping and grabbed a room at developer Steve Wynn’s newest resort hotel. On the Strip, the Tropicana Las Vegas, operated by Tropicana Entertainment LLC, cut its peak rate by 17 percent to $179 a night, while the MGM Mirage’s Monte Carlo’s rate has fallen 12 percent to $240. That would be unheard of in past years, when those rooms would go for as much as $300. I’m not going to CES this year. I’d love to go but I think it’s too far and too expensive for what it’s worth. I am in the same boat as you. I want to go to CES this year, but the cost involved is just too great for the benefits received. It’s nice to see prices drop, but you still have to realize that they are WAYY too expensive even after the cuts. Overpriced hotels are the single reason I am not going this year.